Dry Floury Creamy White Flesh. Maris Piper potato seed dominates the field in commercial growing (excuse the pun). The first eelworm resistant variety but prone to slug damage and scab. It is the cooking and frying qualities of this potato variety that made it stand out from the rest and is the choice of chip shops - and I'm definitely a chip butty fan... yeah, you too - I know! A versatile all rounder with dry floury, creamy white flesh and good flavour which generally keeps its colour when being cooked. 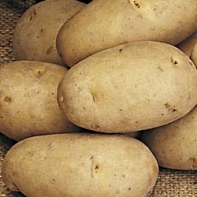 Maris Piper is one of the best known and popular potato varieties on sale today because of its versatility, taste and reliability. 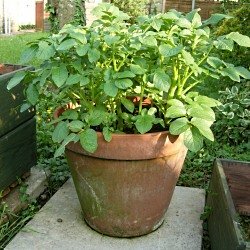 Serious about success - Grow Great Potatoes at Home will turn you into a more knowledgeable and confident potato grower.